Wondering how to celebrate the end of the classic car show season we decided to organise a final run-out for as many as could make it. 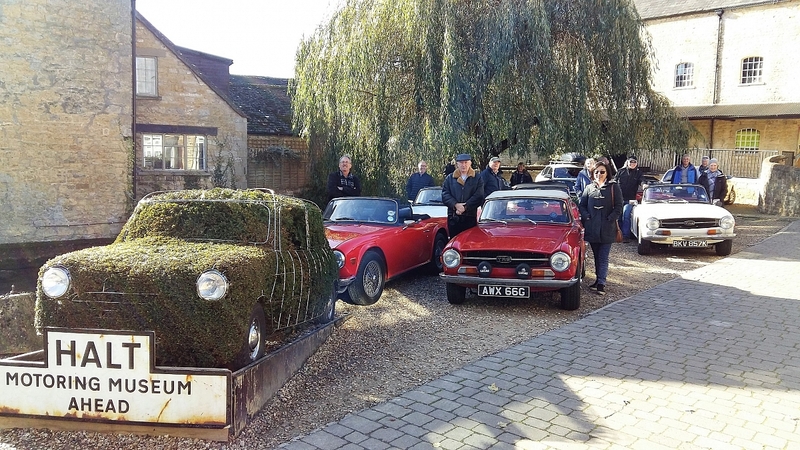 We always prefer using the cars to just showing them off and soon came up with the idea of a trip to the beautiful scenic village of Bourton-on-the Water in the Cotswolds, scheduled for Sunday October 28th. (Good call Geoff Capell!) The weather is always a bit of a gamble at this time of year and, predictably, it started with rain. However our determination paid off and the day became nice and sunny as it went on-albeit somewhat "bracing"! We still had a good number of hoods down throughout though! Bourton is well worth a visit-very picturesque with a fascinating motor museum, where we were able to park all eight TRs-a very good turn out. I expected the village to be fairly quiet in late October-not a bit of it! The roar of various torquey TR engines en masse was greeted with enthusiasm by large numbers of tourists, who immediately got their cameras clicking and whirring when we arrived. It was nice to meet up with Russ Cooper from the Glavon group who came up in his TR7 too. We made quite an impact-lots of people came to look at, talk about and sit in the cars, which were on display outside the motor museum. After some food and refreshments, as well as a good look around, we made our way back to Northamptonshire. A fitting end to the season, though we are still meeting regularly and planning more active events for next year-hopefully we will get another summer of sunshine-but we will be out and about regardless!